Inspiration delivered monthly! 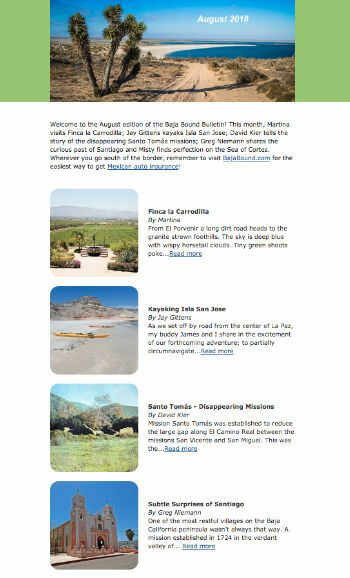 If Baja inspires you as much as it does us, sign up for the Baja Bound Bulletin. Every month we feature wonderful destinations to check out, unique travel adventures, mouth watering meals, and more. Also included are our popular articles about crossing the border (both ways) and updates on how to cross the border faster. Our newsletter will make you run for the border (if you aren't there already!). Travel procedures updates: Tourist cards (FMMs), vehicle permits, etc. Kyle Hargrave, Northern Baja resident and surfer covers a wide variety of Baja subjects from surfing to day trips.